Video: Austin police tackle, punch and handcuff unarmed men for jaywalking. A screen capture of the video shows a police officer who is about to punch one of the alleged jaywalkers on the arm. Videos of police abuse are almost a dime a dozen these days, so it takes a lot for one to stand out. But a video that started circulating online Friday quickly went viral, because it seems to show a particularly shocking case of police officers using violence to respond to what may be one of the most innocuous offenses: jaywalking. It all started when a group of five friends, all in their mid-20s, were walking early Friday morning. “We were walking across the street, the sign said do not walk, but (the) lights were already turning yellow and (the) streets were blocked off so we kept walking,” Rolando Ramiro, who recorded and posted the video, told the American-Statesman. The police then asked for IDs, but two of them responded by yelling an expletive. That apparently offended the cops, and lots of officers started approaching. The video begins with three officers trying to detain one of the men. At one point, one officer appears to put him in a chokehold, and another one can clearly be seen punching his arm. Meanwhile the person is on the ground, demanding to know why he is being detained. “I’m handcuffed already, you can get your knees off me,” the man on the ground says at one point. One of their friends, a woman, starts getting involved and demands to know why he is being taken to jail. “Crossing against the light,” the officer can be heard saying. That woman and another man were also handcuffed and arrested in a violent manner, even though it doesn’t seem like they did anything to resist at any point. One of the three people arrested was charged with resisting arrest. 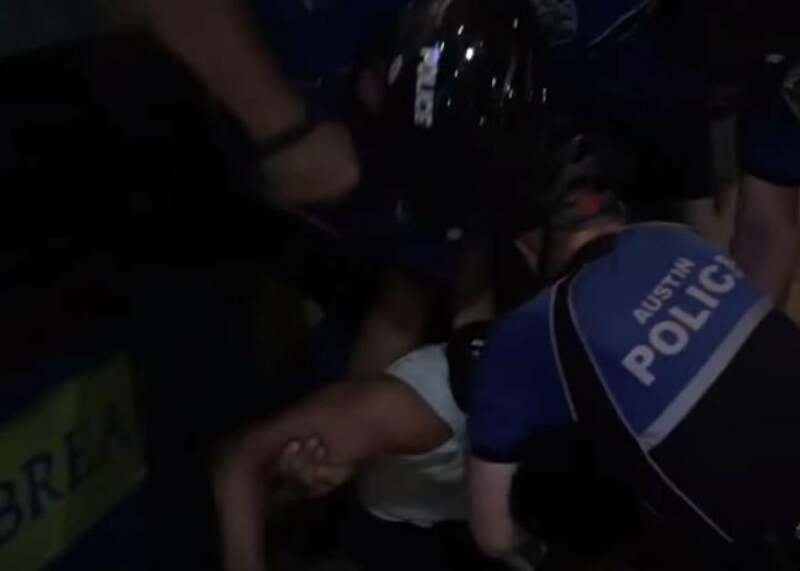 “As is standard protocol, the Chain of Command will review the Response to Resistance and the incident to determine what led up to the events captured in the video and whether the officer’s actions were in compliance with APD policy,” the Austin Police Department said.